The best way to experience Universal Orlando Resort™ is with a 3 Park Explorer Ticket. This multi-park ticket allows you total flexibility to jump between Universal Studios Florida™, Universal’s Islands of Adventure™, and Universal’s Volcano Bay™ over 14 consecutive days. Plus, this ticket also gives you access to select live entertainment venues at Universal CityWalk™, the resort’s hub for food, drink, and entertainment. Plus, you get the Universal Orlando™ 3 Park Explorer Ticket for the same price as a 2 Park Explorer Ticket. That’s 3 parks for the price of 2! It’s a no-brainer! Valid for two full weeks, the 3 Park Explorer Ticket offers unbeatable value – and is only available to buy before you travel. With three world-class theme parks at your fingertips, you will need at least 1 day per park - and that’s if you don’t come back for more... You will definitely want to come back for more!!! It’s the only place where you can experience the magic and excitement of The Wizarding World of Harry Potter™ across two parks, connected by the Hogwarts™ Express which you can ride* with this ticket. Come face to face with tons of your favourite characters; from Minions and The Simpsons™ at Universal Studios™, to Spider-Man and King Kong at Islands of Adventure. 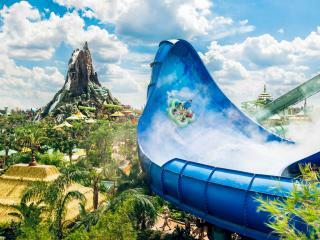 Plus there’s the thrills and relaxation of Volcano Bay™, with 19 unique attractions; from multi-person raft rides to drop slides to a chilled winding river. Enjoy some of the world’s most cutting-edge attractions at Universal Orlando Resort™. This ticket will up your holiday game! The Universal Orlando™ 3 Park Explorer Ticket offers unlimited entrance to Universal Studios Florida™, Universal’s Islands of Adventure™, Universal’s Volcano Bay™ Water Theme Park and select live entertainment venues of Universal CityWalk™ for up to 14 consecutive calendar days and is activated the first day any portion of the ticket is used. The Universal Orlando™ 3 Park Explorer Ticket expires after 14 days irrespective of how many times it has been used and any unused days will be forfeited. The Universal Orlando™ 3 Park Explorer Ticket is only valid to use in the specified calendar year purchased e.g 2018 Universal Orlando™ Tickets must be activated on or before 31 December 2018. Each guest will be handed a TapuTapu™, a waterproof wearable to use while in the water theme park that allows you to hold your place in a Virtual Line™ at the rides at Universal's Volcano Bay™. HARRY POTTER characters, names and related indicia are © & ™ Warner Bros. Entertainment Inc. Harry Potter Publishing Rights © JKR (s18). *Additional restrictions apply. © 2018 MARVEL. The Simpsons TM & © 2018 Twentieth Century Fox Film Corporation. All rights reserved. Universal elements and all related indicia TM & © 2018 Universal Studios. All rights reserved. The Universal Orlando™ 3 Park Explorer Ticket entitles one (1) guest admission to Universal Studios Florida™, Universal’s Islands of Adventure™, Universal’s Volcano Bay™ water theme park, and select live entertainment venues of Universal CityWalk™ (“CityWalk”) on all days during a fourteen (14) consecutive calendar day period which includes the first day any portion of the ticket is used. To receive the full fourteen (14) consecutive calendar days of admission, the ticket must be used by the first use date printed on the ticket. The ticket will expire in full on the expiration date printed on the ticket. Unused days shall be forfeited.